I added joist hangers for extra supprt (I naturally overbuild) I also bulit drop down doors on the side for extra storage as well as keeping the dog out . Wow, well you know if there is ever an earthquake, that bed might be the best thing to crouch next to. I was looking to make my own simple bedframe but with a possibility to add shelves next to the bed. I made this, added the bookshelves and it looks great. Thanks so much! I am so bad with measuring and this was SUCH a help to me. -also I impressed my boyfriend by building my own bed. LOVE IT! Good for you! I totally couldn’t have built this by myself without my husband helping, so you go girl! This is awesome. I’ll be using that plan to build my own this weekend (queen size though). I know you mentioned how sturdy it is, which I’m sure makes it quite heavy. Can you give me an idea of how heavy? I mean is it something that will eventually be able to be moved in one piece, or would you have to disassemble it to remove it from your room? Thanks for any advice you can give! Yes it is very heavy. Two strong people could move it but it would be very difficult to lift up or down stairs, not to mention it might not fit through the door/hall. We built a similar queen size bed before this, and when we moved, we disassembled it. It did creak a little more after we reassembled it so we added joist hangers to prevent the wood from rubbing.as much. I am planning on using this plan for my bedframe for my new apartment! I am very new to woodworking. What length of framing nails/what type did you all use? Thanks! I did this but for some reason with the mattress my be ended up being 3.5 ft tall! It was pretty ridiculous. Ended up having to take the legs off again and took them to home depot to be cut down 8 inches but other than that it looks great super sturdy and heavy and I feel really proud for doing it myself. This is by far the easiest diy plan for a king size bed frame that I have found. We are about to get started on this project and only have one question….. did you not put any support under the middle of the frame? I would love to not have to do that, but just want to make sure that it isn’t necessary. Can’t wait to get started on this project! Nope, not necessary. 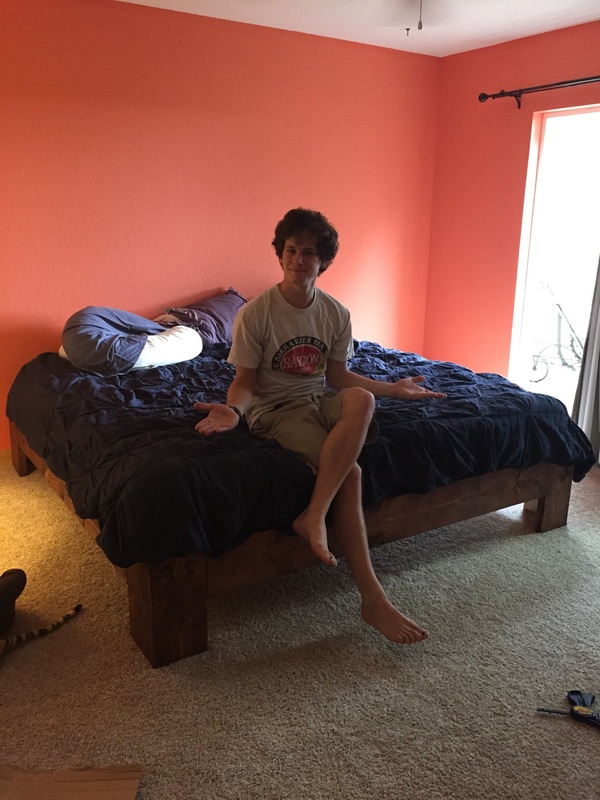 With the 2×4’s set up the way they are (on their short sides), this bed is as sturdy as the second floor of a house. This is a beautiful bed!! I was interested in building a queen, as don’t want a box spring and have a 12inch memory foam mattress. I have looked for dyi beds for about 2 months and have not found one I loved. However, I love this one! How did you come up with the measurements for the king? Do you know what the cut list would be for a queen? We measured our mattress (from IKEA) and added a few inches on either side for fit. Not sure about queen measurements sorry! I have fallen in love with this bad frame! but I am unexperienced at woodworking and need to find a friend with tools. I will need to scale it down to a full-sized bed. If I succeed I will post a picture…but I can tell you it won’t be anytime soon because I’m also a procrastinator. Thanks for sharing these plans. Haha I’m assuming you meant “bed frame” not “bad frame”, lol! Thanks! Great design, thank you. I have read around that pocket holes and screws that are created with the Jig aren’t good for handling load. Has the frame held up okay with just the pocket holes securing the outer frame? Really wanting to try this design. The pocket holes are really just holding the outer part of the frame together. I can’t remember whether we did this or not, but you could always put a few screws through from the inner to the outer frame to make it more secure; then you won’t be relying on the pocket holes. Thanks so much for posting the plans up here! We love our new sturdy bed! http://i.imgur.com/5XG4Ibh.jpg. Planning on adding a wooden headboard at some point but the first goal was to get the mattress off the floor quickly, this was a great help! Quick question; should you add a piece of wood underneath the inner frame of each leg to provide support? That way the weight of the inner frame is not solely being held up by screws alone? Similar to what you would do with a deck frame where the post is notched out to hold the beam. Hope my question make sense as I am no carpenter haha. Yes, you could if you are concerned. It’s not a bad idea, but since it’s only holding up a mattress and two people, we didn’t think it was necessary, and we liked a cleaner look to the legs. If plywood or mdf wasn’t used for the support platform, I assume the inner wood frame design will deform the bottom of the foam mattress. I’m afraid the mattress on plywood/mdf will create mold from what I’ve heard? What size plywood was used? and thickness? Do you have a sketch of where all the nails would go to connect the outer with the inner frame? Residual moisture from plywood as a base will promote mold formation in the mattress. We used a plastic sheet to protect the underside of the mattress from the plywood. But we also live in California where it is very dry, so mold has not been a problem. Hi — This is just about right for my skill level. I’d like to make the frame in two pieces (older house with narrow stairs and tight hallways) — how would you suggest I amend the plan? Divide in 2 width ways, or lengthways, and attached with bolts/nuts is what I was thinking but I don’t know enough to assess which would be more stable. Thanks! Hi — what size wood are you using for the outside frame?? I love this idea! However, like Adam, I am concern about moisture build up between the mattress and plywood deck. Do you think the frame would be sturdy enough if the inner slats were turned on their side rather than standing upright? I am also curious about your measurements. The width of a standard king bed is 76″ but yours measures just 73″. Did you have a special size? Thank you! Ah this is so long ago now I don’t remember exactly. We made the bed to fit the IKEA mattress so it may very well be a non-standard size. Her inner frame does end up measuring 76″, assuming that the two pieces of wood attached at each end are 1.5 inches thick. Yes absolutely. The way it is built right now is way sturdier than it needs to be =p. The reason we did the plywood base is because we had a latex mattress that required a solid base. We put a sheet of plastic over the plywood to prevent moisture bleed-through from the non-dried wood. Are those 2×8 boards on the outside frame? Yes, you’ll see on the sketch they measure 7 1/4″. That’s how wide 2×8 boards actually measure in real life. Odd, huh? How much was this to build? Don’t remember now, but I believe it came to a little over $100 in lumber. I don’t see any nails or screws showing form the outside. Maybe I missed something but how is the inside from attached to the outside frame? Pocket screw holes made with a Kreg jig. If you don’t want to use those you could also just put a few screws in from the inside of the frame. I love your bed plans, but where is your actual plan write-up and your supply list? Thank you for sharing. I used this plan but changed it a little. In purchasing materials I decided not to use 2x8s to save weight and made the inner frame using only 2x4s. Then for the outer frame and legs I used 2x6s. This cut down on weight tremendously and it is still extremely sturdy. I also tacked some plywood on top so I wouldn’t need a box spring (which would make the bed way to high). I also only used wood screws so I attached everything with corner brackets. I stained it dark brown and it look great! It’d be nice to include a list of measurements for those wanting to build for other mattress sizes. Ours is a queen.